Moe was originally released in 2009 at a DD event so for me to get my hands on the first release would be quite difficult. Her head mold is the same as Natsuki’s but they have different face-ups. 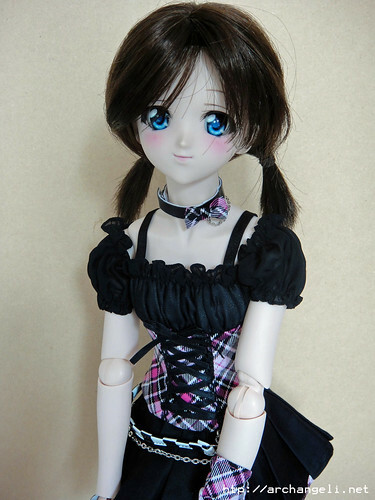 When Kev and I saw the promo photos and information about the re-release of Moe and the new DD III body with improved flexibility we both decided we wanted her in our family. We had someone attend the re-opening festival at the new Volks Akihabara showroom at Hobby Tengoku enter the lottery for us – and we won! Moe was shipped on Sunday and she arrived today! Of course my girls had to come out to greet their new sister! Here are Saber Lily, Airy, and Alisanne all anxiously anticipating her arrival! 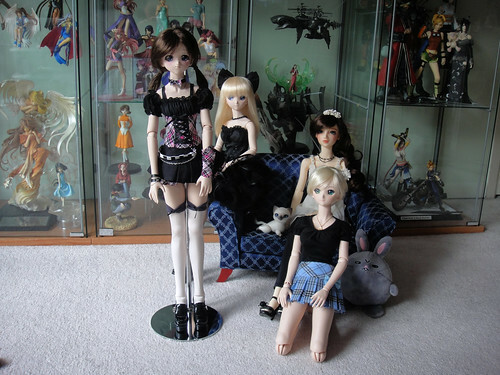 (Makoto wanted to be here, but she’s visiting auntie Machiko right now). Here she is out of the box. She’s so cute! Moe is made of the same softer vinyl that Airy and Neris are, so her head cap is much squishier! 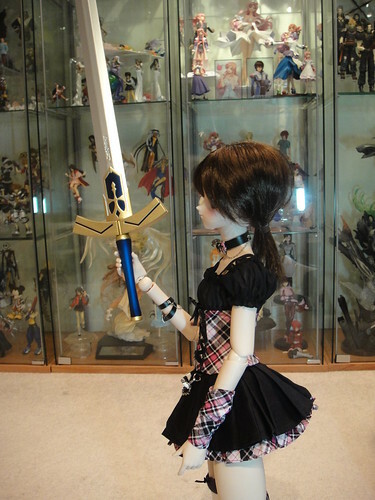 I was a bit apprehensive about her outfit since there is so much dark fabric – and knowing about the horrible incidents that other doll owners have had with outfits like Saber Lily’s maid dress and Beatrice’s school uniform I was wondering how Volks would approach this outfit. Choker: It’s lined in white pvc and closes with a snap closure. The snap is weakly sewn on, so be careful putting it on and taking it of. Blouse: It would be hard to put a body suit underneath because of the shoulder straps and where the sleeves sit on her shoulders. It’s partially liined in white inside (the bodice is lined, the sleeves are not). Closes with 3 snaps at the back. Skirt: A few black threads here and there along the waist and where the snap closure is, but it has a white lining and after studying the construction I’m quite certain it won’t cause stains. I left the outfit on her for over 12 hours today and when I inspected her this evening there were no stains. Jacket: Made of white, so no risk of staining. 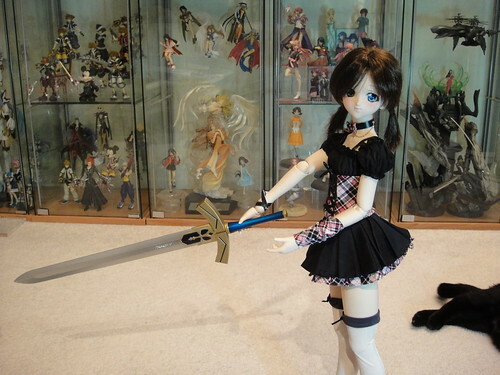 Pantsu: She comes with them. Enough said. I think Volks is trying to eat up their supply of stretchy cotton fabric. Stockings: There is a dark grey trim along the top of the white stockings so I wouldn’t suggest wearing these for long periods of time. Shoes: Cute platform loafer-style shoes. I wore something similar way back in the days when I was a high school girl ^__~” These are lined in white on the inside. Arm warmer: Not lined in white. I got confused because there is only one o_0″ but that’s how it’s supposed to be. Bracelets: There’s only (1) bracelet. It’s one long piece that wraps around twice and snaps on. It’s backed in white PVC to prevent stains. Handbag: Functioning bag -it opens and closes with velcro. 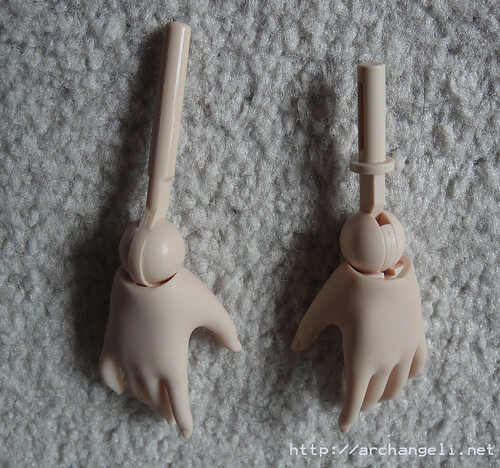 Here’s something interesting – her hand joints are different. DD III on left, DD II on right. Here she is all dressed – isn’t she sweet?! And of course, everyone is super curious about the posing ability of this new body type. I’ve taken several photos of Moe to show the capability of the new DD III body. Sorry about the lighting – I did this in a hurry since I have to leave for work very soon! 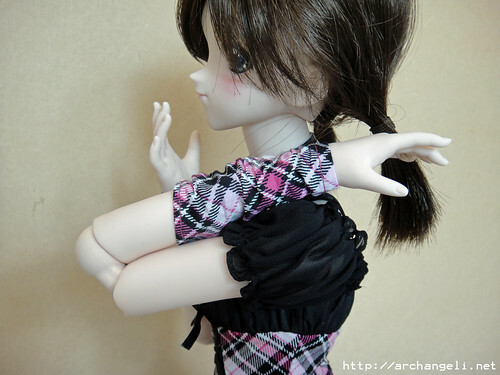 The arms are much more flexible with the incorporation of the “secret joint” into the frame, however her arm pops out when you bend her arm this far. It’s no problem because you can just push it back in again – but this is what it looks like distended (left arm), and what it looks like when you push it back to normal (right arm). Moe was able to copy that with no effort required! 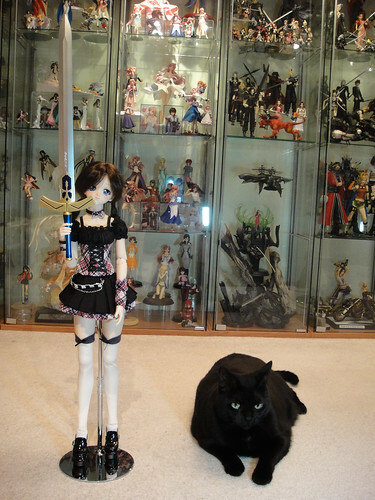 Here are a front and side view – my cat Bubba doesn’t seem too impressed. So to progress, let’s try lowering the arm and re-distributing the weight and center of balance. 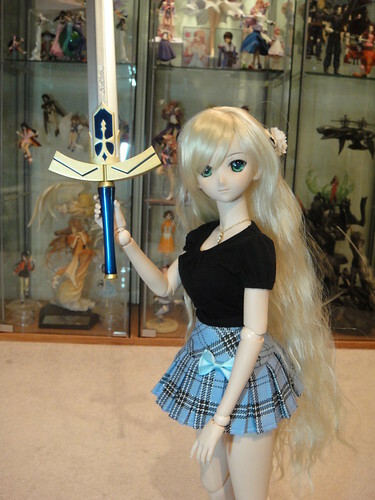 Try as I may I could get Saber to support the sword, so it looks like Moe is on her own from now on. So far, so good. So let’s try lowering the arm even more – it’s straight now! While experimenting with how her legs can move I discovered she can do the full splits! And she looks quite natural and relaxed in this pose. The flat part in her hip piece prevents her from leaning forward or slouching so Moe sits up very straight! The rounded portion kind of wraps around the skeleton mechanism in the torso and I think it allows the back to bend more, without the risk of snapping the peg. The peg fits into the hole in the bust half (as per DDII). Because of the way that piece is shaped, it’s a bit annoying to fit the hips back into place. And this is the updated neck-peg. No comments on what it looks like, but it allows the doll’s head to bend backwards a lot more than before without any modifications that were previously necessary with the DDII. So what do these new changes mean in terms of posability? Well, I’ll let these photos do the talking! 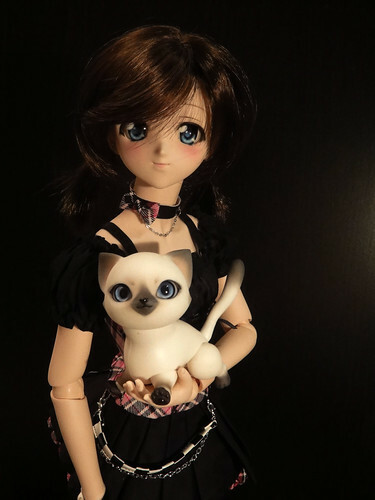 This entry was posted in Dollfie Dream, Review and tagged 2nd, Dollfie, Dream, Moe, release, Volks by archangeli. Bookmark the permalink. Congrats ! and im amazed with that mobility.. cant wait for more pics ! Thanks for stopping by though! 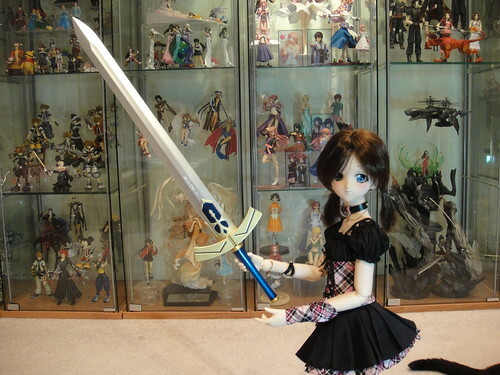 Be careful with getting into this doll hobby, it gets very addictive and expensive >__<"